The Vogue London Emerging Designers cocktail party was held last week in New York City. Georgia May Jagger (yes, the daughter of Mick Jagger and Jerry Hall) and Ed Westwick (Gossip Girl’s Chuck Bass) were host of the evening’s soiree honoring London’s emerging designers. Georgia May Jagger looked stunning in this red, lace cocktail dress paired with leopard print heels! Also at the party were Vogue’s Anna Wintour, Sarah Mower, Meredith Melling Burke, Mark Holgate, and Lauren Santo Domingo along with models and socials Coco Rocha, Lauren Remington Platt, Alexandra Richards and Agnes Phor. Coco Rocha opted for a maxi dress paired with a braided belt and jacket. 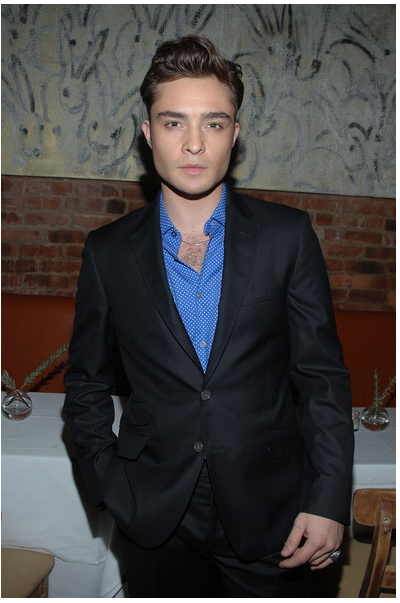 Gossip Girl hottie, Ed Westwick was looking handsome as ever in a dark grey suit paired with a blue (not so buttoned) button-up shirt. The fashionable event took place at Ciano Restaurant, a new hot spot in Gramercy, scheduled to open tomorrow (November 5th). Next ArticleThe Living Jewelry Collection - For best results water every 4-5 weeks!